Tug o' War is a 1-vs-3 minigame found in Mario Party and the minigame compilation title Mario Party: The Top 100. It is based on the real-life game Tug of War. This minigame from the original (along with that of Paddle Battle and Pedal Power) was infamous for causing hand injuries until Nintendo reached a deal to provide padded gloves to players. However, in Mario Party: The Top 100, the Nintendo 3DS Circle Pad was used since the Circle Pad on the 3DS made it safe to spin quickly without injuries. 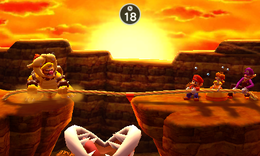 The player in the Bowser Suit has to pull the rope alone while the three players have to pull the rope together. The team who rotates the slowest will fall into a Piranha Plant's mouth. In Mario Party, if the three players lose, the player in the Bowser Suit wins five coins from each player; if the three players win, they each get five coins from the player in the Bowser Suit. This minigame has a Bowser variation, sometimes triggered from a Bowser Space. Here, whoever loses the minigame loses coins. If a draw occurs then everyone loses coins. 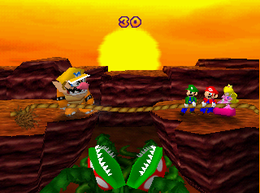 In Mini-Game Island, the player is the solo player in the Bowser Suit and must make the three players fall into the Piranha Plant's mouth. Whoever loses is pulled into the Piranha Plant's mouth, and is eaten. In Mario Party, the loser's/losers' coins are then spit out towards the winner(s), unless if it is a Bowser event. If the solo player wins, he/she walks up, looks in, and then laughs. If the three players win, they do a victory dance. After these events, the minigame ends. Game Rules – "It's a 3-vs-1 Tug o' War against the player in the Bowser Suit. Rotate to pull the rope." Game Rules (Bowser) – "Rotate as fast as you can, because if you lose, Bowser will steal some of your Coins." Advice – "Just rotate your ! When you fall from the cliff, you get eaten by a giant Piranha Plant. Description – "One against 3 is hardly fair–unless that one wears a super-strong Bowser suit!" On-screen (Solo) – "Pull the rope and drag your rivals off the cliff!" On-screen (Team) – "Pull the rope and drag your rival off the cliff!" In Mario Party, if the trio wins, the text will erroneously read "<players' names> WINS!". This page was last edited on October 4, 2018, at 16:22.